Wrinkly, crinkly skin. Whatever you care to call it, that paper-thin skin that starts showing up on various places around your body, neck to knees, is a definite sign of aging. And a real beast to fight. Among the causes: loss of elastin and collagen. Near age 50, we start losing, from our skin’s lower layers, the elastin and collagen that have given our younger skin its elasticity and firmness. The loss of elastin and collagen over time causes wrinkles. We develop lines, sagging, and crepey skin. Aging skin loses about one percent of its collagen each year. That rate increases if you expose your skin to large doses of sunlight. And gravity is always there to lend a helping hand. About the same age, we begin to lose fat, both superficial and deep, along with bony skeletal support. The results: facial sagging, and other changes in shape and contour. As skin ages, it loses its ability to retain moisture. Hormonal changes begin to thin the skin’s outer layers, bringing on that parchment look so familiar in the aged. We hope, therefore, that replacing moisture from outside can help reverse the process. The trouble is: Most creams won’t sufficiently penetrate the epidermis—the skin’s outermost layer. Proteins can help, in theory. But these—applied topically, at least—have little chance of penetrating deep enough to restore lower layers. Vitamin A creams—Renova and Retin-A amongst these—can have some effect toward rebuilding collagen. But these products irritate many skin types, and simply bring worsened flakiness to the skin of the neck, jaw, and cheeks. Dermatologists can perform certain facial treatments, but the results are temporary. Think of crepey skin not as a local condition, certainly not as a superficial one, but as a condition vitally connected with the overall state of your body and its general health. Its health, in particular, considered from the inside. Can you plump your skin and underlying tissues from the inside? By all means, get into some type of weightlifting practice. Lifting weights can help define your muscles and create a more toned appearance to your skin from the inside out. Developing muscles will help your skin look tighter as they balloon outward, just as a sagging, deflated inner tube fills and firms when inflated. You may find your dermatologist might actually be against the cupping massage. Why? Because it runs counter to everything dermatologists and cosmetic surgeons typically do. Consider practices from their world, such as Botox or similar injections. Those practices are about adding to the body. The cupping massage is about deleting poison from the body. Incompatible! If you’ve been given Botox or any similar injection, you certainly wouldn’t then want to apply suction cups—this would simply spread the toxic substance through your tissues. The cupping massage is quite inconsistent with any kind of injection or filler. When dermatologists are asked about cupping massage—especially used for the face—their usual reaction is: We don't know what the long-term effects will be. Fair enough. They don’t. Not in terms of long-term studies of carefully selected populations. But I do. I’ve been using the cupping massage for at least six years. It works! Now I am using my RejuvaCup HD (Level 2 Facial Cupping)! Watch the video below. Think waste. Waste in cells. Waste between cells. Some of this waste gets broken down and shed by enzymes within cells. A byproduct, however, called lipofuscin, can’t be broken down, and accumulates in various organs, including—and between—skin cells. These defective, damaged proteins build…as newer proteins struggle to be built—a losing battle. This rate of formation and removal is balanced and finely tuned when we’re young. But as we age, the battle gets badly out of balance, and damaged proteins fill our cells and the spaces between. Now, here’s what I believe happens during the cupping massage…Tissues—and the cells themselves—get squeezed and pulled. Aging cells, in the process, suffering from their own waste, become cleansed and rejuvenate. When you do your first cupping massage, you might see some dark spots appear on your skin. No need for alarm. In fact, it’s time to rejoice! All that gunk is leaving your cells and extracellular space. These spots will go away within a week or two. And if you keep performing your cupping massage, they’ll stop appearing altogether. 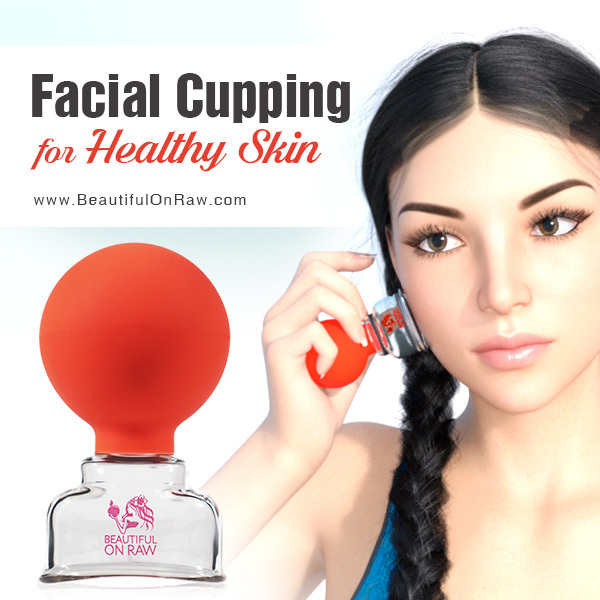 Cupping massage for beautiful skin. I believe cupping is a skin practice for the future. I believe the time will come when “everybody” will be cupping, because the results are so stunning. However, if you’re waiting for some proper scientific research that ably proves that cupping visibly slows degeneration of the skin, addresses loose skin and blemishes, and, over time, gives the appearance of a plump thickening of the skin, it might not happen soon enough for you to prevent crepey skin. When it comes to that crepey skin that often arrives with age, prevention is the key. To have outer beauty, you must first create inner beauty. I do not mean to say that a loving and kind person will not be overweight, or that someone who is compassionate and patient will not have acne. We’re talking about another kind of internal beauty, a beauty that comes from healthy internal organs. Aging is the mirror reflection of your liver, colon, heart, kidneys and arteries losing their peculiar kind of “beauty.” Eat raw foods, the way we were intended to, and you will achieve the inner cleanliness and vibrant health that will manifest into radiant outer beauty. 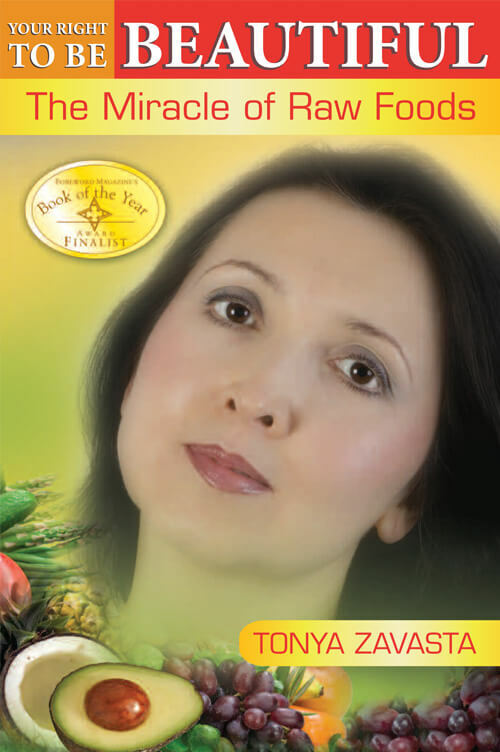 My first book, Your Right to Be Beautiful, was written about this very transformation process. Once your body is clean, thriving, and working to its best ability, it will reward you with a beautiful outer shell. Raw foods will slow down your overall aging process—your skin’s aging, most specifically.